By Kori ~ August 16th, 2010. 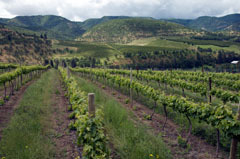 The Pines Vineyard, located the The Dalles, Oregon, is home to some of the oldest vines in the Northwest. Their Old Vine Zinfandel vines are over 100 years old. On our trip to the Columbia Gorge earlier this summer, we toured The Pines Vineyard with owner Lonnie Wright. Louis Comini, an Italian stone mason and immigrant, originally planted the Old Vine Zinfandel at The Pines Vineyard in the late 1800â€™s. When current owner, Lonnie Wright, first came to The Pines Vineyard in 1982, neither he nor the owner at that time knew who had planted the Old Vine Zin. By then, the vineyard had been abandoned for twenty years and was struggling to survive. The Comini name surfaced years later when a retired fire chief from The Dalles approached Wright and told him that he remembered going into “old man” Cominiâ€™s wine cellar with the Comini twins to steal Dago Red when they were teenagers. Knowing that Dago Red is what some people called Zinfandel in the old days, Wright thought he might be close to discovering the story behind the Old Vine Zin. Later, Wright was interviewed by Oregon Agriculture magazine. When he was asked who planted the vineyard, he said he thought a fellow named Comini originally planted it. After the article was published, Wright started getting phone calls from the family of Louis Comini. As the story goes, Comini came to the United States from Genoa, Italy. He landed in Baltimore and then made his way across the country to San Francisco and then moved north to work on the Cascade Locks in the Columbia Gorge. Toussaint Mesplie, a Frenchman and the first Catholic priest on the east side of the Cascade Mountains, went to Fort Dalles with the soldiers out of Vancouver. At the time, his two brothers were panning for gold in California. Mesplie wrote his brothers to let them know that they were giving away land in Oregon and encouraged them to come up and get some. Theodore Mesplie staked a claim to the land in 1852 that is now The Pines. Toussant Mesplie met Louis Comini and offered him a job to come to Fort Dalles and make headstones for the Catholic cemetery. Through that relationship, Comini ended up planting the vineyard on Theodore Mesplieâ€™s property. Comini made the communion wine for the church. Wright does not know the exact year the Old Vine Zin was planted but does have pictures of it that were taken in 1911. Theodore Mesplie died in 1916 without a will. His five children divided his property. One of his daughters inherited the part of the property on which the vineyard was planted. Along with a wealthy businessman in Portland, she formed The Pines Corporation around 1930. They sold it to a guy who wanted to turn it into a destination spa, aka â€œfat farmâ€. When he had trouble making payments, he partnered with a guy in Salt Lake City who owned fitness clubs and spas all across the country and who eventually bought it outright. Eventually, he decided to sell it. A cherry farmer in The Dalles was in the process of buying it when Lonnie Wright entered the picture. Wright got his start in viticulture in 1978 when he and several others planted 2,000 acres of grapes for the first vineyards at Columbia Crest in Paterson, Washington. Under the tutelage of Wade Wolfe and Clay Mackey, experts in vineyard management in Washington State, Wright became the area manager for 650 acres of grapes and supervised the first harvest. In 1980, Wright married a girl from Hood River, Oregon, and promised her that they would move to the Gorge in a year after he completed what he considered to be his training in the industry. Lonnie Wright and his wife Linda moved to The Dalles in 1981. He heard that a cherry farmer was buying an abandoned vineyard in the area and was going to try to bring it back to life. Unannounced, he showed up at 7am the morning work was to start and found the cherry farmer standing out in the field with six women he had hired and a General Viticulture book from UC Davis open to the page on pruning. Wright told him that while he had never brought an abandoned vineyard back to life, he did have vineyard experience and was promptly hired. 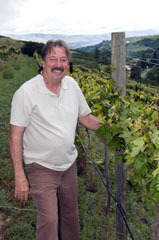 In 1983, Wright started a vineyard management company called Columbia Country Vineyards. In addition to his work at The Pines, he also plants and manages vineyards for others in the area. About three or four years after he went to work for the cherry farmer, the farmer ran into financial problems, and he had to give The Pines property back to the guy from Salt Lake City. Since that owner did not have any interest in grapes or wine, he asked Wright if heâ€™d be interested in moving onto the property and taking care of it. Wright and his family moved on in 1987, got a twenty-year lease, and started expanding the vineyard. The first winery to produce Old Vine Zinfandel from The Pines Vineyard was Sineann, a partnership between Peter Rosback and David Oâ€™Reilly of Owen Roe. When they first released their Old Vine Zinfandel, most people assumed it was from Washington State since it carried the Columbia Valley appellation on the label. In fact, many retail shops and restaurants put it in their Washington sections. [The first time we had it, earlier this year, we were told by a local shop that it was made from Washington grapes.] Since Wright was leasing the place at the time, he did not really want to draw attention to the place and increase its value because he hoped to be able to buy it someday. In 2002, Wright bought The Pines Vineyard, so now he is more than happy to tell people where those Old Vine Zin vines are located. One thing that youâ€™ll notice in the pictures is that the trunks of the Old Vine Zin donâ€™t look like gnarly, century-old vines. Thatâ€™s because they are not. The vineyard froze to the ground in 1991 and 1996. The trunks that are visible now have been there since 1996. 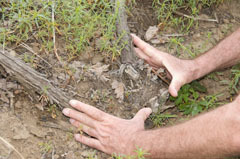 However, the roots have been there since the late 1800â€™s. Today, Sineann and Wrightâ€™s own The Pines 1852 Winery use the fruit from the Old Vine Zinfandel. The Pines Vineyard totals twenty acres. As I previously mentioned, the original eight acres of Old Vine Zinfandel were planted in the late 1800â€™s. Wright used starts from the Old Vine Zin to plant five more acres of Zinfandel in 1987 and then planted two more acres of Zinfandel in 2002. Wright added Merlot in 1991 and 1993 for a total of three acres. He also planted four acres of Syrah in 1994. The soils in the vineyard are mostly sandy loam with a little bit of silt loam. 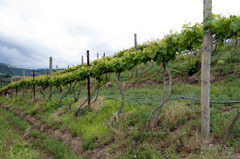 The vineyard gets about seventeen inches of rain each year. The elevation at the top of the vineyard is about 650 feet, though it feels much higher when you are up there. Wright believes that one of the things that make the valley where the vineyard is located special is that Mt. Hood sits at the head of the valley and so it gets nice, cool breezes at night. On days when the temperature reaches 94-95, it will quite often go down to 60-62 at night. After years of growing grapes and selling them to others, Wright decided it was time to keep some of that fruit for himself and start his own winery. In 2001, he founded The Pines 1852 Winery. Peter Rosback of Sineann is the winemaker. The Pines 1852 has a tasting room in downtown Hood River, Oregon. Their annual production is 3,500 to 4,000 cases. Both the vineyard and the winery remain family-owned and operated. Unlike many working farms, the Wrights do offer vineyard tours of The Pines Vineyard. So if you are in the area, I highly encourage you to call ahead and make an appointment. Zinfandel vines, especially century-old vines, are not something you get to see very often in the Northwest. Very nice article and great research on the history of The Pines, Kori. I stumbled upon the Pine 1852 Tasting Room in Hood River and bought some of this Old Vine Zin immediately. It ends to disappear though so I can’t keep it in the cellar. Thanks. I was a fascinating place to visit and research. You are absolutely right, Old Root Zin doesn’t quite have the same ring. 🙂 Cheers!